One might be forgiven for thinking that color just sits there. However, shades and hues have a mysterious world of their own. They show up in unbreakable math problems and inexplicably strange animals. The most fascinating facts and mysteries involve the way that humans and colors interact. From those who can hear colors to seeing them in the emotions of others, green and all the rest will never again just sit there. Red is perhaps the first color that humans used in abundance. This popularity began in prehistoric times but might have nothing to do with the vibrant hue. That was a bonus. What made red so widely available and user-friendly was ocher. This natural pigment was easy to find and use. It never faded, but it did stick to skin and walls. Those who first used the clay were not even modern humans. The oldest find was a group of 70 ocher pieces at a site where Homo erectus lived 285,000 years ago. 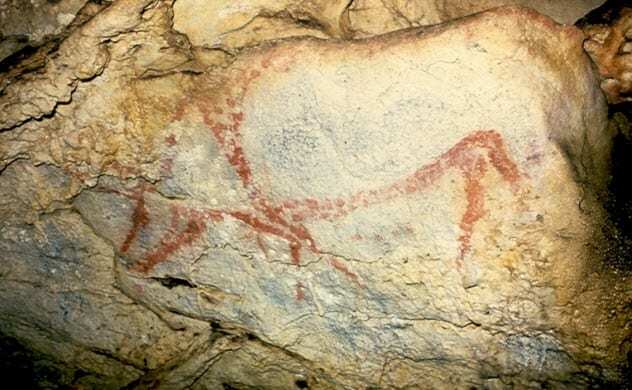 Neanderthals also painted with it 250,000 years ago. Among the earliest Homo sapien artifacts involving ocher was a shell holding a mixture of the pigment, fat, and charcoal aged around 100,000 years. Ocher had other applications, too. It was used to stain graves, tan hides, ward off mosquitoes, treat medical conditions and skin ailments, and symbolize various things. It was also an ingredient in glue and plant processing. Ocher remained in use for a long time, even by medieval and Renaissance artists. Even though water is colorless, it darkens the color of material. There is an intriguing science behind this. The darkening has nothing to do with the cloth’s makeup or the wet fabric actually turning darker. This illusion is caused by wavelengths messing with the human eye. Two things happen when light hits an object. The latter both absorbs and reflects certain amounts of light. The wavelengths that bounce off an object and back into the eye create the perception of color. A yellow cloth, for example, absorbs everything except the wavelengths for yellow. The color we see is the shade of the wavelengths being reflected. Dry and wet surfaces dismantle light differently. 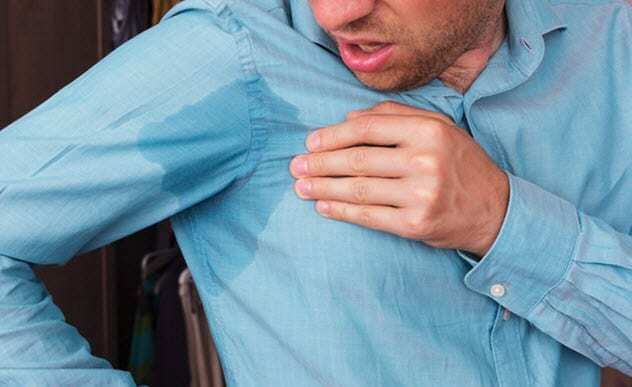 Wetness, like a water or sweat stain, changes the angle of light in such a way that more yellow wavelengths reflect into the cloth rather than into the eyes of a person. This makes the viewer see a wet spot as darker, compared to the dry surrounding fabric that reflects more color back into his or her vision. 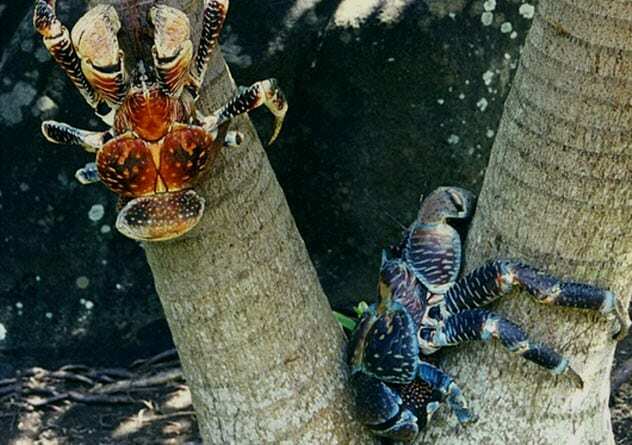 The coconut crab from the Indo-Pacific is a two-toned enigma. They are giant land crabs with a taste for coconuts, and they also come in three colors. The baby crabs are white. This part is normal as far as scientists are concerned because the paleness is linked to their juvenile form. When they grow up, however, the crabs randomly turn either a vibrant blue or red. All attempts to find out why came up empty. There is no apparent reason why some turn red while others go Smurf. Tests on hundreds of crabs proved that the color difference had nothing to do with gender, location, camouflage, mate attraction, a specific behavior, or other physical reason. There was neither a clear benefit to being either color nor any competition. There was blue as much as there was red. A very good reason must exist for why coconut crabs keep both shades, but nobody knows what it is. DNA might solve this riddle. In the future, scientists hope to find the genes behind each color as well as those linked to the crabs’ vision, which may reveal if the creatures can perceive blue and red. The human eye can distinguish about a million hues, but blue was a late bloomer. In the 1800s, researchers studied Homer’s poem The Odyssey. The long piece did not contain a single reference to the color blue. Instead, Homer used strange shades, including “wine-dark” for the sea. In the following years, scholars tore apart Hindu, Chinese, Icelandic, Arabic, and Hebrew scripts. There was no word for “blue.” The first people to use it were the ancient Egyptians, the sole culture who knew the secret to blue dye production. Modern scientists are trying to find out if this multicultural lack of talking about blue meant that humans could not perceive the color. An interesting study was published in 2006. The Himba tribe from Namibia has no specific term for “blue” and does not distinguish it from green. During tests, they struggled to pick one blue square among 11 green ones. However, they have an extraordinary ability to detect different shades of greens that other people cannot see. Studies like these suggest that blue was as abundant as today, but the human eye could not separate it as a distinct shade until recently. The New Guinea skink is odd. From the outside, it looks like a normal lizard. But inside, nearly everything is green, including blood, skeleton, muscles, and membranes. Usually, blood is red because of hemoglobin, the pigment that carries oxygen. 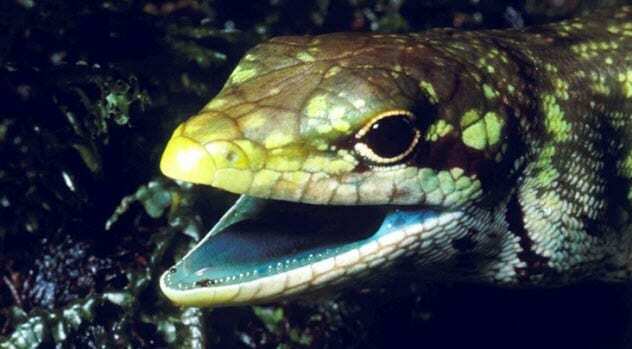 The New Guinea skink’s blood has another pigment, biliverdin. As red blood cells die, biliverdin is produced and too much hides the red of hemoglobin. Such large concentrations are toxic. Humans and other species have systems in place to eliminate the pigment. In 2018, a new study shed some light on the bizarre creatures. After building a family tree of over 50 types of Australasian skinks, they discovered that the green-blooded ones were not related. This means that the evolution of toxic blood and tissue was not a single event. Instead, it evolved separately in five species. For something to show up repeatedly in unrelated skinks proved that the biliverdin dominance was not accidental. Scientists cannot explain what perks the green blood offers or how the reptiles survive what is essentially an overdose of biliverdin. Ignaz Troxler was a Swiss doctor and polymath. Even though his name is not widely known, his legacy lives on in the weird “Troxler effect.” Intrigued by colors and objects that faded away while still in his vision, he wrote about it in 1804. This disappearing trick recently made the rounds on the Internet by way of a page infused with soft pastel colors. Staring at it (see the image above) makes the page go blank, almost by magic. The second the viewer’s attention returns, the colors rush back. Scientists allow Troxler’s theory that the peripheral vision eventually erases unchanging details, but they have a better understanding of what is going on. The Troxler effect happens to everyone on a daily basis. Without it, most people would go nuts. We encounter too many stimuli, which the brain counters by fading anything it deems to be unimportant. That’s why most people forget the clothes they wear and that their noses are visible. 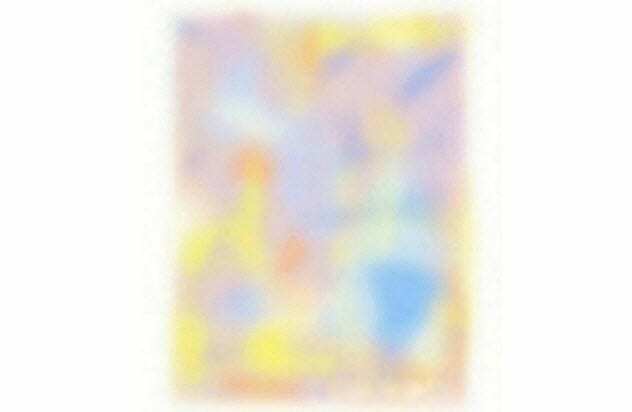 The pastel page’s content disappears because peripheral details fade by adopting the color of the surrounding white as retinal cells receive no new information. Essentially, this illusion bores the brain into dismissing it. Many modern bird species produce eggs with beautiful shells. Recently, researchers found that the two pigments responsible, protoporphyrin and biliverdin, also turned up in an oviraptor’s eggs. An oviraptor is a tiny dinosaur resembling a bird. To find out more, scientists broadened the study. 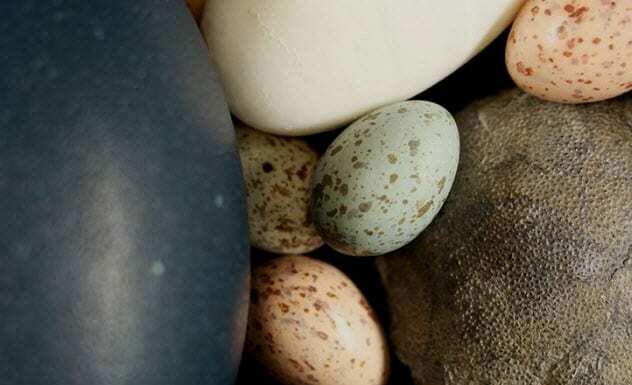 They analyzed eggs from existing birds, including terns, emus, and chickens. For comparison, they turned to the fossilized eggs of 15 Cretaceous species and extinct birds. What they found shattered the belief that shell colors are a recent development in bird eggs. The two color pigments showed up in more ancient eggs, especially those of eumaniraptoran dinosaurs. This is significant because they are the ancestors of living birds. Incredibly, some eumaniraptoran shells were patterned, pigmented at the same depth as modern eggs. The colorful camouflage likely developed when some dinosaurs abandoned buried nests in favor of guarding their eggs on the ground. Incredibly, this means that tinted shells evolved millions of years before the birds that lay them. In 2018, researchers proved that idioms such as “green with envy” were not just prose. 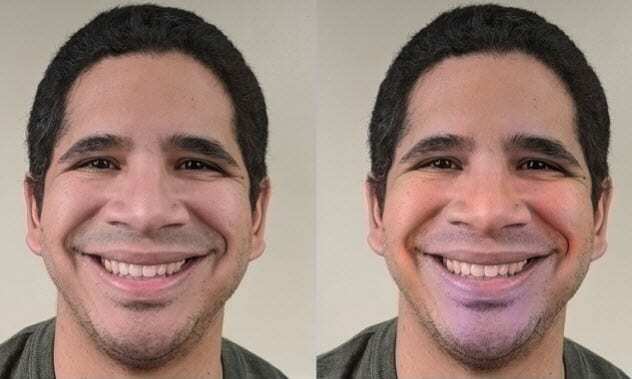 Depending on the emotion, human faces really do change color. This chameleon habit, which is linked to blood flow, is very subtle. Most of the time, hues are so light that other people only subconsciously pick up on the person’s true emotions. The affected areas curve around the eyebrows, cheeks, chin, and nose. With the help of a computer program and an understanding of how humans see color, scientists revealed facial rainbows for the first time. Disgust bloomed as a blue-yellow shadow around the mouth and colored the forehead and the nose with red-green. Happiness infused the cheeks and temples with red but tinted the chin blue. Strangely, “surprise” was close to “happiness,” with a redder forehead and a chin with less blue. Looking at pictures of a neutral face, volunteers were mostly able to pick the right emotion when its colors were superimposed on the image. Other pictures showed the wrong shades for an expression—for example, happy colors on an angry face. But the volunteers instinctively felt that something was wrong, although they could not say what. 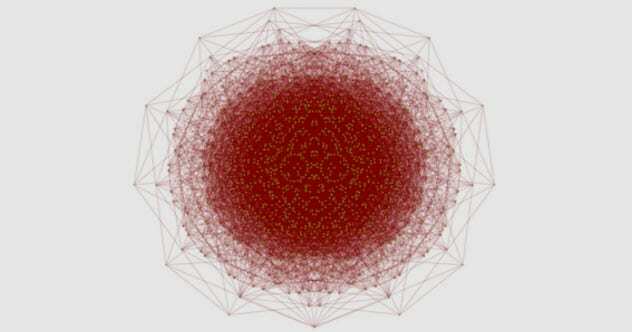 There is a quirky mathematical riddle called the Hadwiger-Nelson problem. Created in 1950, it remains unsolved. It sounds simple: On an infinite plane, there are colored points connected by lines. How many colors are required to prevent the same shades from touching? Soon after the problem was created, mathematicians quickly discovered that a limitless Hadwiger-Nelson plane would only need four to seven hues. Then they got stuck. For decades, nobody could narrow down the number. In 2018, an amateur mathematician published his take on the problem and it stunned the math community. Aubrey de Grey, who likes to solve mathematical riddles in his spare time, proved that at least five colors were needed and not four. The breakthrough happened as he tinkered with the Moser spindle—a shape with seven points and 11 lines. After stacking an enormous population of spindles together and throwing in some other shapes, he narrowed down the number by linking 1,581 points. The fewer the points, the more successful the graph is considered to be. Using de Grey’s work, mathematicians have since managed to connect 826 dots without any of the five colors touching. Around 4 percent of humans can hear colors. The condition, called synesthesia, is real. Scans proved that the brain’s regions for sight and sound activate when somebody experiences the phenomenon. Scientists understand some things about this mysterious ability. 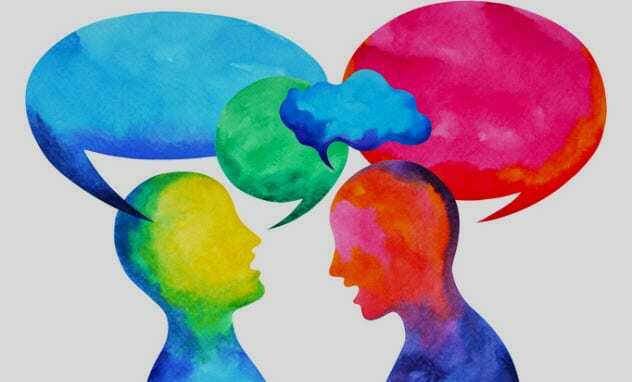 A sound or word can automatically trigger a color in the mind’s eye. Synesthesia also appears in people whose brains have more connections between the areas of their senses than normal. DNA sequencing isolated 37 gene variants that might be responsible. When researchers analyzed the biological purpose of each, one process stood out. Across several of the 37 genes, axonogenesis was more enhanced. This makes sense. Axonogenesis wires the growing brain and explains why those with synesthesia have more plentiful wiring. Read more fascinating facts about color on 10 Bizarre Ways Color Affects Your Brain and 10 Fascinating Facts About Color.